I think the population conversation has reached the point where we can finally get together to start growing positive responses to our rather unpleasant problem. One reason I think this is because we now have a clear response from the corpo-political propaganda machine. We know what form their propaganda is taking, and so we can use it to develop a discussion of the true facts. Here’s the scoop. One evening last week I watched three different videos that all claimed to be documentaries about overpopulation. One was right wing, one was left wing, and the third was from the BBC. The BBC program was quite good, a little wordy, but describing the problem realistically. They addressed the common concerns, and also the common excuses and misunderstandings, and pitched out some ideas about what we might want to do if we care about the future. Both the right-wing and the left-wing American programs made it clear that their respective propaganda machines – if they are indeed different machines – are gearing up. This is good news, of course. It means they feel threatened by the reality of the problem. But, talk about the elephant in the china shop, both right and left completely avoided discussion of the real problem. And, to displace our energy on to subjects they do not care about, the right-wing documentary tried to pick a fight with the left wing, and the left-wing documentary tried to pick a fight with the right wing. They did this with emotional hooks, aint-it-awful games, and irrelevant issues. I don’t mean the issues are unimportant. The more important they are, these symptoms, the more they distract our attention from the basic illness – the basic cause of the problem. And it is like diseases. We can’t really cure any disease unless we deal with whatever caused it in the first place. Otherwise, the disease just gets worse. Neither of these documentaries talked about the disease. They both want us to do more of what caused the problem in the first place, and that is economic and population growth. That’s why I’m not recommending either of them to you. If you want to view the BBC series on Planet Earth, it is now available on DVD and the issue is discussed in the last two episodes. 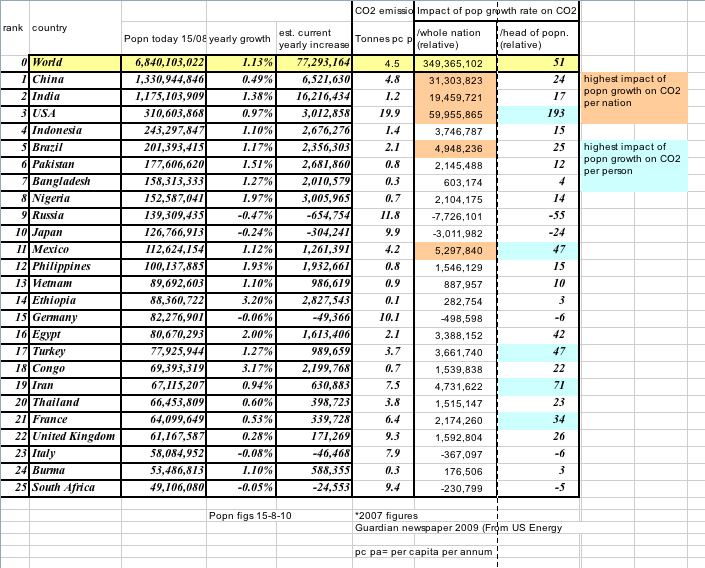 Last week I pointed out that the energy for all economic and biological growth comes from the living earth ecosystem. Specifically from the plants. The earth can not grow any bigger than it is, and the plants cannot make any more organic energy than they can make. So, we are fine and dandy population-wise as long as there are fewer than 100 people for every 100 units of organic energy that the earth can produce. When there are more than 100 people for every 100 units, and when this level of population is already causing suffering, we cannot cure, or even help that suffering of the ecosystem by growing the world population or the world economy. It’s simple mathematics, and I find it amazing when some people claim the math is wrong and then believe in miracle cures. The math is not wrong. If you think this doesn’t apply to Americans, then please go to http://www.factfictionfancy.wordpress.com, where I will post a table prepared by D. Bennett. (here it is folks) . Meanwhile, we are talking about the whole earth ecosystem. The ecosystem is not divided into countries. This is a whole-world problem. Trying to grow the population at this time in any country of the world will only cause more suffering for more people later. That’s what the Green Revolution did to us. I don’t want to see us do even worse to the next coming babies. So, back to the documentaries. You wouldn’t believe two films about the population problem could each gush for an hour or so, and never talk about the population problem. Both the left- and right-wing documentaries presented impressively edited facts, out of context, and then went on to emotional gushing about things that they want. Or things they don’t want. What I want is to go back 50 years and do over the green revolution and get it right this time, instead of making all the same mistakes over and over and over again. But nobody can solve a problem by wanting something else, and problems do not go away by wishing – or by make-believe. And nobody ever solved a problem by doing more of what caused it in the first place. Next time I’ll talk a bit about why these people want to try.